Pop in and fill in an application form to receive your own loyalty card, providing you with a host of loyalty card benefits' when you next visit. (up to 6 people. excluding Sat night and Sun lunch). 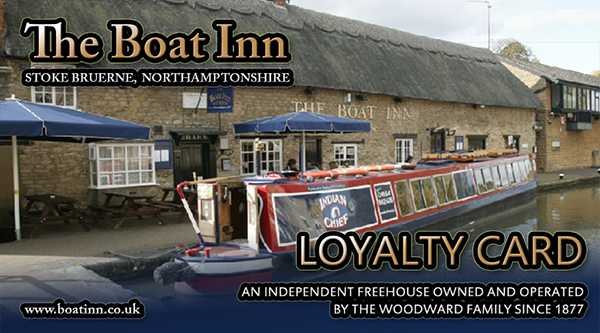 We ('The Boat Inn' and Management thereof) reserve the right to end any or all offers at any time, without prior notice. Loyalty cards cannot be used in conjunction with any other offer or promotion. Loyalty card promotions and offers apply exclusively to the named Loyalty card holder. An application form must be filled in first, in order to obtain a loyalty card. The necessary fields on the form must be completed. Loyalty cards can in some cases be used between departments i.e. Restaurant, Bar & Bistro, subject to promotional offers at the time. On the spot offers may be available to Loyalty card holders from time to time. Loyalty card holders details will not be distributed to any third parties, at any time. Offers may change over time. Ask for details in reference to current promotions and offers. To qualify for a loyalty card, applicants must be aged 18 or older. Promotional emails may be sent out on occasion to loyalty card holders as notification of new deals/offers and any other information of relevance relating to The Boat Inn, Stoke Bruerne and/or loyalty card.